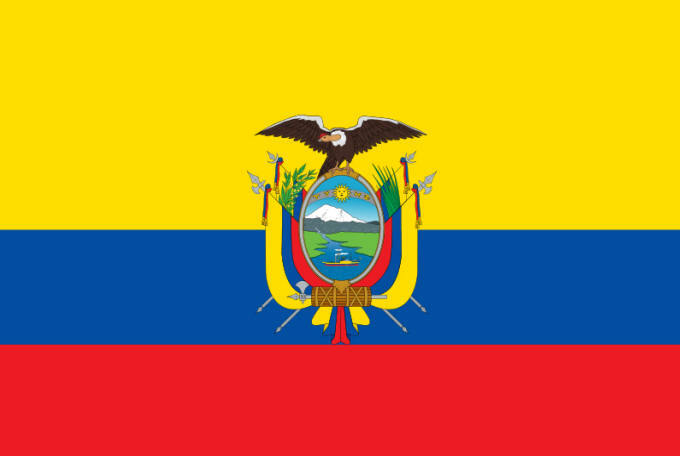 The flag of Ecuador was first adopted on September 26, 1860. In 1900 the coat of arms was added to the center of the flag. The design of the flag is very similar to that of Colombia and Venezuela, because the all were former constituent territories of Gran Colombia (1819 to 1831). The Ecuadorian flag has three stripes, with the yellow band being double the width of the red and blue stripes. The yellow band represents the richness of Ecuador’s national resources. The blue stripe stands for the sky and shores of Ecuador. The blood of the national heroes is symbolized by the red band. The day of the Ecuadorian Flag is observed every September 26.